we were all walking on water. some sat in outdoor chaise lounges. others leaned against things that were nice - it was a real gathering. i was looking in a direction for nothing other than, that was the direction i was looking in. it caused trouble of some sort i think, someone thought. my looking in that direction was disturbing. it disturbed them, i think. maybe it was a disturbing thing? this is what they thought. they thought: "doesn't everyone look in a direction? how could you have your eyes open - be looking and not look in a direction?" there was tension i think, maybe. where could i look - there was someone in every direction? feeling it now; it's all finally coming together for me - i'm pretty sure. they like my work - i'm always on the phone. so when you call and i'm busy you have to understand - 'cause i finally did it, i got outta la grange. i'll remember everybody i think. i'll remember you fondly - i'm remembering now. but it was all small town you know? there's a certain speed and style with which i'm moving now, and that wasn't for you, right? people change - and i'm changing, but you hand around, and hang on to the old stuff. the things i collect and touch now reflect where i'm heading. the furniture fits a style - a certain psychological buffer between me now and who i was then: emotional and pedestrian. it's all logical and informed now. i'm beyond, i think, fights and fighting... yelling. furniture with style and stainless steel things - they shine, and soon i won't feel bad, ever again. With five tracks, one of which is a stream-of-consciousness spoken-word affair, on this EP, Wheat proves that, despite what its recording output may indicate, it's not a gang of slackers. In fact, That's Exactly What I Wanted sees the band finally achieving the potential it hinted was possible for years. Combining its slowly unfurling shoegaze-inspired melodies with production values that pile sonic layers to the ceiling, Wheat conquers everything from start to finish with this EP. Once again favoring the elliptical song structures and minimal sound of 1998's Hope & Adams over the too-direct pop attack of '03's Per Second Per Second Per Second... Every Second, Wheat deliver a sly pop song in three acts. The intro makes good use of Scott Levesque's falsetto, which cracks effectively on the highest notes. The second act deploys classic power pop riffs, handclaps, and melodies, culminating in a de facto chorus that sounds like the band's vying for the Cheap Trick mantle. The song's catchiest moment isn't repeated. The expected payoff never comes, the instruments fall away, and the band launch into a nearly a cappella third act, which layers Levesque upon Levesque upon Levesque to create an odd-- and oddly moving-- chorale. Like their earliest material, "Little White Dove" is intended to be elusive and elliptical, a gracefully concise pop haiku. 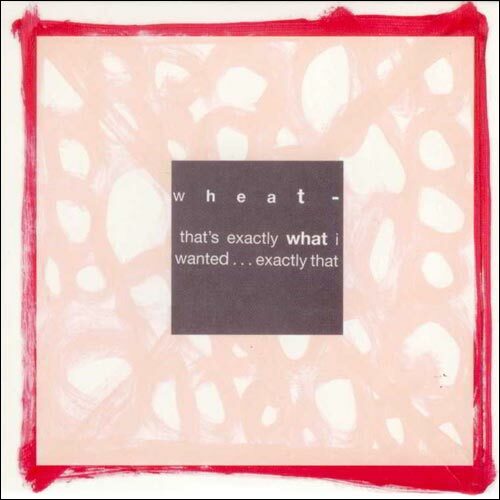 In some ways, Wheat is a difficult band to categorize. Their sound effortlessly mixes classic pop sounds with studio gloss and technological trickery that would come off as awkward in the wrong hands. Yet there's nothing over polished or robotic on this stunning band's new mini-album. Rather than take a straightforward path to pop simplicity, Wheat is ultimately a playful group, adding layers of synth-addled sound to otherwise simple structures. Much like their previous albums Hope and Adams and Per Second, Per Second, Per Second...Every Second, That's Exactly What I Wanted is a melodically mature EP, almost country-like in its folk leanings. "Little White Dove" is a pretty standout, a piano ballad with the added weight of shuffling drum sequences and ethereal waves of guitar. But the closer, "Washing Machine Blues," is the true peak, a perfect, warm instrumental that's just as romantic as it is melodically appealing.